Installing a pre-hung interior door isn’t difficult if you follow these steps for how to frame a door first. 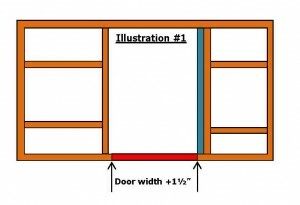 Before you try to install a new interior door, follow these steps for how to frame a door. 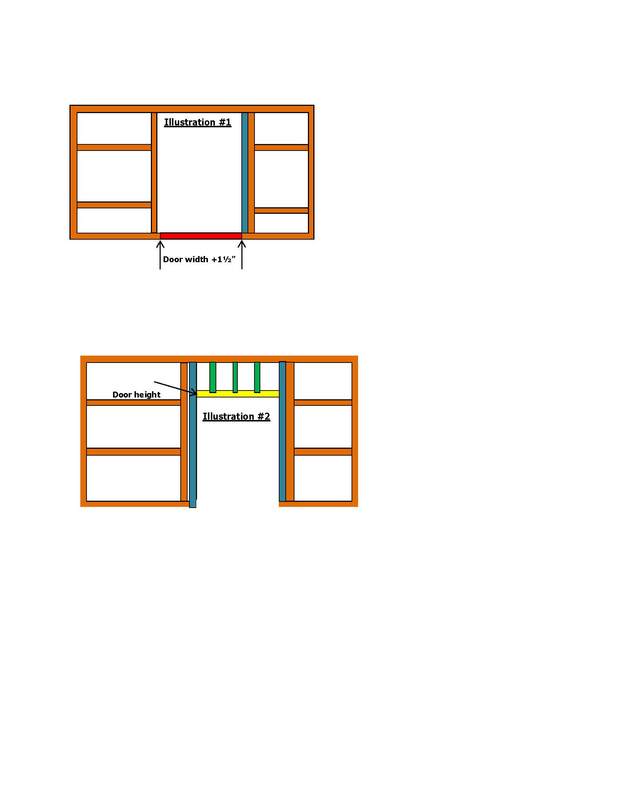 Select one of the existing studs for the stud that will hold the door. Before you select a stud, determine whether the door will be hinged on the left or right side, and if it will open into or out of the room. Once you have selected the stud (for this example, we are using the stud on the right side), use a set square to make certain it sits square to the top stud. Use a level to make sure it is vertically plumb. If it is not, pull the nails in the stud and re-nail it so it is exactly square and plumb. Now you are ready to nail a 2×4 jack stud (blue) to the king stud. This will give you a double stud from which to hang the door. Remove any horizontal studs that cross with the door space. 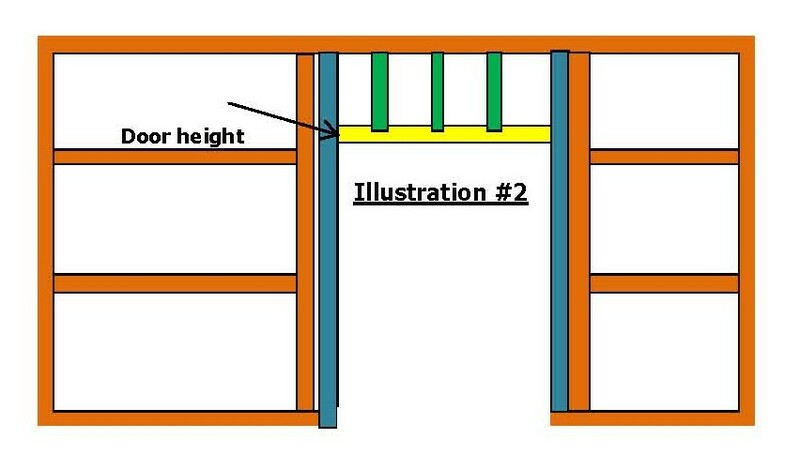 Measure and mark the door width across the bottom. The instructions that come with the door will give you the width you’ll need. If there are no instructions with the door, measure the width of the door. Add 1½ inches to the width and use that as your width. Mark the base plate using a set square. Set the circular saw to cut to a depth of 1½ inches and cut through the base plate (red). You will have to use a hand, multitool or reciprocating saw, to cut the baseplate next to the blue jack stud. Remove the cut base plate (red in Illustration #1). Get the exact measurement from the instructions that came with the door, and mark the height on the blue jack studs. You may have to add a little more to the height measurement to take into account any carpet or tiling. Measure the distance between the two jack studs, and cut a 2×4 to the exact width. Nail the cut 2×4 (yellow) to the jack studs, at your door’s height measurement. See Illustration #2. Next nail cripple studs (green) between the horizontal 2×4 (yellow) and the top stud. See Illustration #2. You’re ready to hang the door.